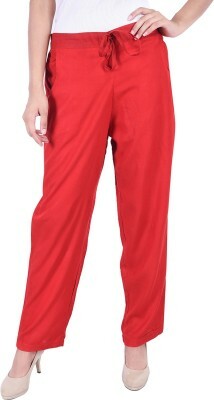 Lend yourself a distinguished look by donning this colored plazo pants from the house of MARAMI.. It is made from a premium quality material that makes it light in weight and skin friendly too. Further, it comes in an appealing pattern featuring an excellent finish that will attract you in just a glance. Sure you a comfortable fit, this pair of plazo pants promises utter comfort all day long. It is recommended to pair these plazo pants with a contrasting colored kurta, kurti or top and high heels for that stunning look. Makes it durable and desirable.